So, this cake lasted a day at the house. It got a much better reception than I anticipated, and though I’m still trying to be gluten free, I did try a nibble. Then again, I shouldn’t be surprised it all vanished, it’s cake. And not just a cake, one with warm spices, sweet, roasted parsnips and a dusting of powdered sugar. All season, I’ve been wanting to use parsnips in some way other than roasting them and gobbling them up. They are so good roasted that this cake almost didn’t get made because I couldn’t keep my fingers out of the pan. I really should have bought quite a few more but hindsight is 20/20; next time. I’ve noticed that my store has really mega parsnips, and I read somewhere once that parsnips can be quite tough when they’re big. They have a tough core in the middle that is chewy and fibrous. This is one of the reasons that parsnips have made such a late appearance in my kitchen. I didn’t want to pay $2 a pound and then throw away half of them. Last week, finally, they had some medium sized parsnips and I jumped on them so I could make this cake. I still removed the core even though the parsnips were pretty tender, and I recommend it because even after roasting, the core tends to get stringy. Even though you’ll be pureeing it, you don’t want strands of fibre in the tender cake. My original idea was to make this like a carrot cake using shredded parsnips but knowing how sweet they get when roasted, I decided to make it like a pumpkin cake instead. I didn’t want to interfere too much with the flavour of the parsnip so I didn’t add things like raisins, nuts or pineapple like a carrot cake. I don’t like raisins in my food or baked goods, I’m weird I know. I will pick them out! I only tolerate them in couscous and Arabic/Indian rice. This Roasted Parsnip Cake didn’t need anything. It ended up being just wonderful plain with a sprinkle of powdered sugar. We’re not big frosting eaters at home, and I usually never frost my cakes. We will have warm custard poured over some of our puddings or maybe ice cream on the side, but usually never frosting. I’m sure if you’d like, a cream cheese frosting would go quite well with this cake, but I think a dusting of sugar is all it needs. And one way to have it look pretty and not frost it, is to use a bundt pan; instant decoration. 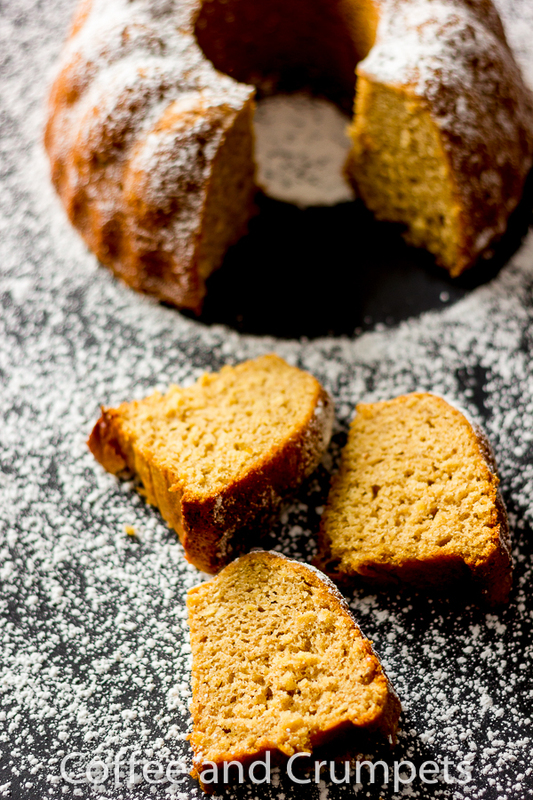 A roasted parsnip and warm spices bundt cake. Grease or spray an 8 cup bundt pan. Mix the flour, baking powder, baking soda and salt together in a bowl and keep aside. Peel the parsnips and quarter lengthways and remove the core. Chop into medium pieces and place in roasting tin with a smidgen of oil. Place in the oven and bake until soft, about 20 minutes. Allow to cool and try not to eat them all. Puree them in a food processor. Using a mixer with a paddle attachment, or by hand, beat the eggs and sugar together. Add the parsnip puree, the oil, the sour cream and the spices. Blend slowly till a batter forms. Mix gently until well incorporated, use the mixer for a few turns then finish off with a spatula by hand. Pour batter into the greased bundt pan. Bake in the centre of the oven for 40-45 minutes. Check to see if golden and risen, use a toothpick to see if the cake has set. When completely cooled, turn over the bundt pan remove gently. *High Altitude Bakers: omit the ¼ teaspoon baking soda. I made this cake with just 2 teaspoons baking powder and it rose beautifully. The sour cream in the cake will also give a little more acidic batter and that will help set the cake also. I hope your week has started off productive and well. It seems however, in Texas a little bit of cold weather has bought that State to a stand still! My friends in Texas have been posting FB statuses about “snow days”, we had snow for two days straight and below freezing temperatures and still had to take our kids to school! I find it all very amusing; until it’s morning time when I’m cursing under my breath as to why we don’t have snow days for a bit of ice! This is really lovely Nazneen. My mister’s mum introduced me to parsnips but I never thought about making CAKE! I’m with you on the no frosting thing. Looks like a sprinkle of powder sugar did the trick 🙂 Looks delicious. Add coffee cup! Love the photos and using the parsnips! I can’t get enough of them lately, roasted until they are like candy. Can’t wait to try this! I’ve never heard of such a thing, but it sounds and looks delicious. I’m all over that cream cheese frosting idea. This looks amazingly delicious Nazeen. I’ve never tried parsnips before, didn’t really get my attention in stores. Do you roast them in the oven before mashing them? Using parsnips in a cake is a great idea! They’re so sweet and mildly spicy, I bet they go perfectly with the nutmeg, cloves, and cinnamon. Yum! Yeah, why not, if you can make a yummy cake with carrots, there’s no reason it shouldn’t work with parsnips. It sounds unusual, but I’m sure it worked. I bet it was delicious. I can never imagine using parsnip in a cake. You are genius, Nazneen! This really sounds good with all the spices. I do love parsnip, though I have only used it in chips and soups. This cake is a must try. What a gorgeous cake! No wonder it was gone in a day. Love the use of roasted parsnip puree – never used that in a cake, but did use pumpkin puree. I am sure I would love this cake – it has everything I like! YUM! Well done! This is such a beautiful blog. I love the way you take photos of the food. So lovely really. Will try!! Dear Naznee, what a wonderful cake recipe! I love parsnips so much and I use them whenever I can – they are widely available but can be quite pricey around here. I have never made parsnip purée though and although I baked cakes with shredded parsnips (sans the fibrous core) before, I had never crossed my mind to be using the puréed parsnips for baking instead. That must be one delicious and moist cake – just like a cake that I would bake. Thanks for yet another wonderful inspirational recipe – do stay warm! This is new to me and I am so happy. I love parsnips and I think this is a great way to use them. Very creative, I must say! And pretty and I bet delicious. No wonder it was devoured! Abbe@This is How I Cook recently posted..Orange Cacao Rub, Roasted Paiche and a #Whole Foods #Give Away! Choc Chip Uru recently posted..Australia Day 2014!!! Really nice light on your pictures. And a really nice recipe, too. I’ve never made a cake with parsnip, but I love the idea. The color is fantastic! And I’ll bet the flavor is, too. Really good stuff — thanks so much. I really love how diverse you are with fruits and vegetables. I try to include every one of them in my cooking too. If it’s in the markets it has to be at home. But I have to admit, I wouldn’t have thought of this combination in a cake. We make quite a few soups with parsnip during autumn. I don’t know why but I love it in soups. I love it more that you used it in the form of a puree. How wonderful! Why would you need a frosting for something as elegant as this! Lovely recipe Nazneen. I have always wanted to try baking with parsnips. This cake makes me want to even more – it’s beautiful! Laura Dembowski recently posted..Peanut Butter and Company Giveaway! Thank you, Laura! They have quite a mild taste in the cake but its there, you can taste them.They are quite yummy! Thank you for stopping by! I have never heard of using roasted parsnip in a cake! That is so interesting and I love learning something new so thank you! I am so glad you just dusted it with confectioners’ sugar instead of using a glaze – it looks like this super moist cake needs nothing. And it is so beautiful!! My favorite type of everyday cake is just like this one – all about the cake itself. I can totally see how this was so popular at your house. Thanks Monica! It was super moist and I didn’t think it needed a glaze or anything. I also like my cakes a little less sweet so this was perfect. eheheheh is very satisfying when the things you cook don’t last long, isn’t it? Thank you Nazneen, how I said in one of my posts, I’ve just started to feel me confortable with new ingredients of my new country, today you’ve taught me a new one (the parsnip). Yes, it is a nice feeling to have it finish but I was hoping it would last longer so I didn’t have to bake something else so soon!! And you’re welcome, trying new ingredients is exciting and the best part of a new country, cuisine and culture. One of my favorite things was puréed parsnips with cream, made for me by a British friend. I was never able to get them as smooth and silky as she did, and your post helped me to understand why. I never knew about the stringy cores before! Thanks! And thanks, also, for this cake recipe. Oddly, I am not a fan of carrot cake because it is usually so oily. I like that your recipe only has 1/2 cup of oil! Can’t wait to try this! David recently posted..When in Rome…? Thanks David! Yes, the cores are tough and string! However, they release quite easily from the centre of the parsnip so that helps! I’m not a huge fan of carrot cakes, the only one I’ll eat is my own! I have never seen a cake made with roasted parsnips but I so see how delicious and moist this bundt cake would be. I agree with you it is so pretty and simple with just a dusting of icing sugar. Great tips on the parsnips and will keep that in mind next time I see them in the market. Great recipe. Going to pin this one! Thanks Bam! Yes, it was a very moist cake and I didn’t think it needed any frosting. It’s not very sweet either which I prefer too. That’s interesting to use roast parsnips. I like that. I made a parsnip & 5 spice cake just before Christmas but used grated raw parsnips although using roasted would be sweeter I think. I’m going to shut up moaning about the cold here – at least we are above freezing. Thanks Nancy! The roasted parsnips worked out well and they were so sweet! It’s not a very strong flavour but you can taste them. Some days here are really cool and beautiful, and some days are just downright freezing. Stay warm! Yep! Perfect with some tea or coffee!